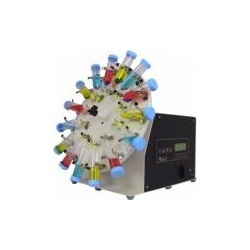 If automation or timed events are required this mixer can solve many lab issues. Several types of vials or tubes can be placed on the large disk provided. In addition, custom designed disks are available for most other types of containers. Varible speed adjusts the mixing action from a gentle slosh to rapid agitation. Driven by a continuous-duty motor, it can stand up to demanding schedules and long hours of operation. One thumbscrew permits easy changing of heads. Containers remain visible during rotating. The sturdy, stable, well balanced and compact base handles substantial loads. Furnished complete with test tube head.